General Motors is reportedly gearing up to auction off "about 100 of its prized antique and show cars to raise cash and trim warehousing costs," according to a story in Sunday's Los Angeles Times. A check of the Barrett-Jackson website shows three historic Saturn vehicles going on the block this Thursday. The vehicles are in addition to the nine classic Saturns auctioned earlier this year. 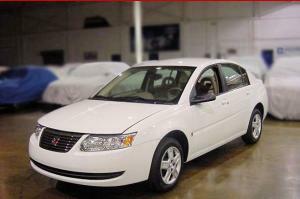 Among the latest Saturn for sale include this 2007 Saturn Ion - the last Ion ever built in Spring Hill, Tennessee. It features a 2.2 liter Ecotec engine with automatic transmission and Goodyear 195x60x15 tires. You can bid on this Saturn, and other vehicles from General Motors' prized "Heritage Collection," by following the instructions posted on the Barrett-Jackson website. Automtoive News reports that Pontiac plans to build a vehicle based on the Vue's Theta architecture beginning in the 2006 model year. The Pontiac sport wagon would help fill capacity in the CAMI Automotive plant in Ingersoll, Ontario where the new Chevrolet Equinox is built. There are currently 8 users and 523 guests online.